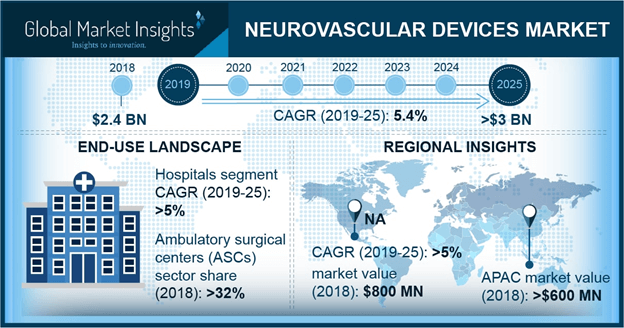 Neurovascular Devices Market size is set to exceed USD 2.1 billion by 2024; according to a new research report by Global Market Insights. High demand for minimally invasive surgical devices will significantly drive neurovascular devices market growth over the forecast period. Absence of post-operative complications, enhanced effectiveness and better patient outcomes are the major factors escalating demand for neurovascular devices market. With use of minimally invasive neurovascular devices, patients experience reduction in recovery time. Such factors will favor considerable growth in the future. Embolic coils segment accounted for largest revenue of USD 523.4 million in 2017. Minimally invasive and cost-effective product intended for treatment of brain aneurysms is major factor for segmental growth. Improved design to provide maximum efficiency will favor segmental growth in the future. Coiling procedure technique segment contributed to largest revenue of USD 607.0 million in 2017 owing to rising prevalence of intracranial aneurysms. Also, increasing influence of minimally invasive procedures will escalate demand for coiling procedures that does not require incision in skull. Increasing burden of intracranial aneurysm will escalate demand for coiling procedure, thus propelling segmental growth. Ischemic stroke segment is expected to grow at 2.7% during the forecast timeframe. Segmental growth is attributable to rise in number of ischemic strokes worldwide, owing to rising geriatric population. According to World Health Organization (WHO), 15 million people suffer from stroke across the globe annually. Increasing incidences of ischemic stroke and high adoption of neurovascular devices will favor industry growth over forecast timeframe. Hospitals segment accounted for largest market share of 88.4% in 2017. Increasing adoption of neurovascular devices owing to rise in number of ischemic strokes will lead to segmental growth. Various government policies in developed countries for treatment of neurovascular disorders and growing healthcare expenditure in developing countries will favor segmental growth across the forecast timeframe. U.S. neurovascular devices market will grow at 3.6%, owing to high pervasiveness of brain aneurysms. According to Brain Aneurysm Foundation, stroke is the third leading cause of death in U.S. High prevalence of unruptured brain aneurysm will favor business growth. high disposable income and increasing government expenditure on healthcare will further lead to business growth in the future. Japan neurovascular devices market accounted for revenue size of USD 144.7 million in 2017 owing to rising cases of brain aneurysms coupled with increasing geriatric population. High pervasiveness of brain aneurysm is credited to growing geriatric population. Rising geriatric population will escalate number of brain aneurysm cases, thereby propelling industry growth.